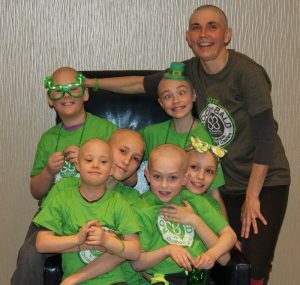 OSWEGO – The 13th annual St. Baldrick’s Day in Oswego fundraiser, set for March 31, will be a fun-filled event for the entire family. the Oz Brygade members left “column” from top Brandon, Lena and Nadia in front of her, right “column” Zoey, Maya, Kai – last name is Turaj.All are from Hannibal. “Last year, we tried to make it more family-oriented, and this year we’re taking it a step further,” explained Volunteer Event Organizer Dan Witmer, who helped introduce the St. Baldrick’s Foundation – dedicated to raising funds to support life-saving childhood cancer research – to the Oswego area in 2007. In addition to the face-painting, the popcorn and cotton candy, and live music, this year there will be some surprise guest appearances of popular children’s characters, courtesy of Party Appearances. “I can’t promise who will show up, but I saw some Muppets and Teenage Mutant NInja Turtles on their website,” said St. Baldrick’s volunteer Cathie Weeks. Among the many raffle prizes and silent auction items, there will be family-themed offerings such as a one-month family membership to the Oswego YMCA, tickets to the MOST in Syracuse, ski passes to Song Mountain, tickets to Enchanted Forest/Water Safari, tickets to the Rosamond Gifford Zoo, a family pack of tickets and more for the Syracuse Mets, as well as tickets to the Crunch, the Amerks, the Knighthawks, and much, much, more. “I think parents and children will have plenty to keep them busy; we’re trying to provide something for everyone, but especially the children,” said committee member Terra Pritchard. Also expected this year are some of St. Baldrick’s “Honored Kids,” local children who are currently receiving cancer treatments. With two weeks to go, more than 105 individuals have registered to shave, with more expected to get on board soon. 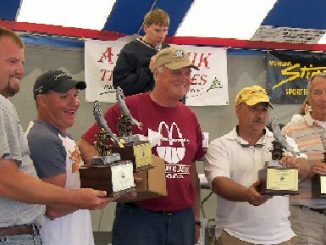 The 2019 event will run from 1-4 p.m. at the Lake Ontario Event and Conference Center on East First Street in Oswego. Walk-ins are welcome, but only shavees who raise $50 or more are eligible for a St. Baldrick’s T-shirt. A time schedule for fundraising teams will be posted by March 24; otherwise, appointments are not necessary for individuals. To register as a shavee, barber, or volunteer, join or create a fundraising team, make a donation, or simply learn more about the St. Baldrick’s Foundation, please go to www.stbaldricks.org.